In the last post, I had proclaimed a victory for dietary carbohydrate restriction or, more precisely, recognition of its explicit connection with cell signaling. I had anointed the BMC Washington meeting as the historic site for this grand synthesis. It may have been a matter of perception — many researchers in carbohydrate restriction entered the field precisely because it came from the basic biochemistry where the idea was that the key player was the hormone insulin and glucose was the major stimulus for pancreatic secretion of insulin. We had largely ignored the hook-up with cell-biology because of the emphasis on calorie restriction, and it may have only needed getting everybody in the same room to see that the role of insulin in cancer was not separate from its role in carbohydrate restriction. To get an idea of where this becomes important we’ll look at a beautiful and compelling study by Kalaany & Sabatini entitled “Tumours with PI3K activation are resistant to dietary restriction.” The starting point for that study was, again, the long-standing observation that dietary caloric restriction is capable of causing a decrease in the growth rate or even the incidence of some cancers. The experimental model in Kalaany & Sabatini was a collection of (non-obese diabetic, severe combined immunodeficient) mice into which human tumors had been grafted, so-called exo-grafts. It turned out that some of these tumors were sensitive to dietary restriction (DR; 60 % of energy requirements vs controls allowed to feed ad libitum). The difference in repression of growth between the DR and the ad lib mice for different tumors is shown below. 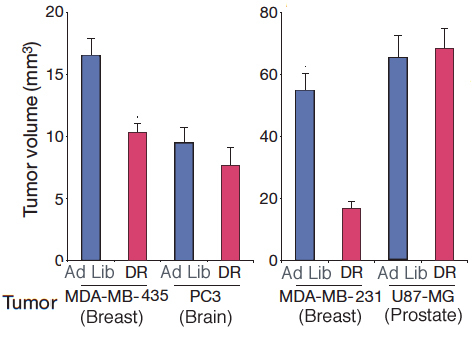 In the tumors from breast, the tumor volume was significantly reduced (more than half in MDA-MB-231) on dietary restriction compared to ad lib feeding. The tumors from brain or prostate, however, grew to a constant volume regardless of their diet. (PC3 had a smaller volume then others but this was not further reduced by DR). What could account for this difference? Consistent with previous reports in the literature, all of the mice in the study showed significant decreases in circulating levels of insulin so the effect wasn’t in the level of hormone, per se. There was a difference, however. When the cells from the different tumors were isolated and grown in tissue culture medium, it was found that the growth of cells from the DR-sensitive mice were stimulated by increasing amounts of insulin. Cells from those tumors that did not respond to calorie reduction grew whether insulin was there or not. In other words, diet-sensitivity had something to do with insulin-sensitivity. It is odd that this did not immediately suggest that it was carbohydrate, rather than calories, that was the problem. It is reasonable, though, to interpret the reduction in total calories as a de facto reduction in carbohydrate and an associated reduction in insulin production and, from this, the insulin-stimulated growth although this has yet to be explicitly demonstrated. According to this picture, those cancers that do not respond to calorie-reduction do not respond to insulin, that is, somehow, their growth mechanism is always in the ‘on’ state. As described in the previous post, the reason this interpretation was not the immediate response was because there was a general focus on those components downstream from the initial dietary stimulus. This was done on the grounds that any such elements that were found might serve as targets for drug development. The underlying rationale was that obesity is caused by excess calories and that obesity then becomes the stimulus causing other physiologic effects, in particular, whatever the link to cancer is. With this POV, calories becomes equated with body mass and less attention is paid to the effects of specific macronutrients. While this mechanism undoubtedly plays a part, it is just as reasonable — probably more reasonable — to think of obesity and the effects on cancer and other pathologies as parallel effects of a central stimulus and that stimulus is likely tied to insulin in some way. Also, many mice strains, particularly the widely used C57Bl6 mice, respond to high fat diets in ways that humans do not, in particular, saturated fatty acids which may affect insulin resistance are related to dietary saturated fat in rodents but, in humans, plasma saturated fatty acids derive largely from high carbohydrate intake. In any case, tradition is strong in medicine and reference 1 of Kalaany & Sabatini points to a 1909 German paper “The relation between diet and tumor growth” which was several years before insulin and the insulin-carbohydrate connection were known. The Many Elements of Downstream Cell signaling. — Enrico Fermi on the subatomic particles. How does a particular cell know, with all the things that could happen, how to respond to stimulation by a nutrient, drug or hormone? The question is how the stimulus, the binding of an insulin molecule, for example, to a receptor, the proteins on the cell surface can be translated into the cell response, the change in permeability that lets the cell take up glucose, or encourages the cell to store fat, or to carry out any of the other consequences of insulin stimulation? Our understanding of the stimulus-response process is at an early stage but it is already so complicated and so difficult to keep straight that one wonders whether it will ever be possible to get a global picture that anyone can understand. 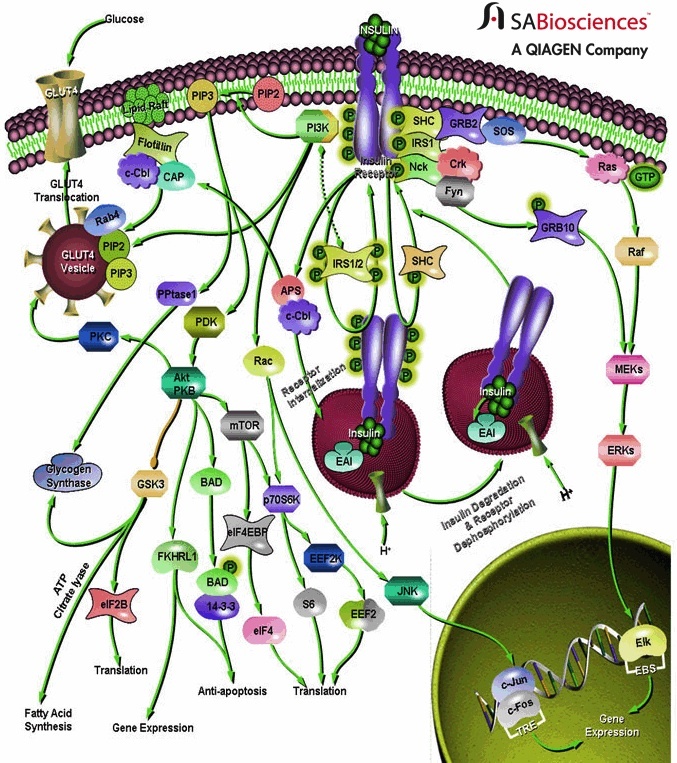 The figure shows the response to insulin signaling and indicates how complicated it can get; I resisted providing comparison graphics of the New York subway system or the genealogy of the Kings and Queens of England. The figure shows that, complicated as it is, there is already a company that will help you measure all those things. There are, however, a couple of key players whose activity bears directly on early stages of insulin signaling and that were part of Sabatini’s experiment. I will describe these first at the level of simple names of things, like Richard II and Richard III. I will then try to give a simple description of the underlying chemistry because it provides some insight into the global picture. Kalaany & Sabatini gave us a view into what is going on: it will turn out that insulin response is different in the cancers that respond to diet compared to those that don’t because the two types differ in the early steps following stimulation. The binding of insulin to its receptor is a signal that is transmitted by activating an enzyme called PI3K (pr. Pea-eye-3-kay). A simplified view of these early steps is shown below in an abbreviated picture of the cascade of changes that ultimately leads to a change in the permeability of cells to glucose (the best known of the many effects of insulin signaling). A good deal of understanding is possible just by focusing on these early steps because this is a likely site of insulin resistance. Again, just talking at the level of names, what the figure shows is that once insulin gets attached to its receptor, the information that it has been bound is transmitted to the enzyme PI3K. PI3K transmits information via the chemical reaction PIP2 ➛ PIP3 and then signaling continues in sort of fire bucket brigade until it has the final effect of bringing the glucose channel, GLUT4 to the surface of the cell, allowing glucose entry. The analogy of the subway system is better than the English kings because the subway system is reversible (notwithstanding the history of English monarchs killing each other). Trains run in both directions. Another protein PTEN (pr. Pea-10) reverses the effect of PI3K. An important intermediate step is the activation of the enzyme called Akt. Thus, the information is transferred insulin ➛ PI3K ➛ Akt ➛ activate glucose transporter ➛ glucose uptake. Below, I discuss a little of the chemistry that Kalaany & Sabatini were able to bring out. It may be more than you want to know but here is the bottom line: they measured the response of cells at the level of Akt (middle of the diagram) and found that some of those tumors that don’t respond to diet have a mutation in PI3K that allows the enzyme to be active all the time, that is, enzyme activity is un-responsive to insulin signaling: the system is always ‘go.’ Other cells have a defect in PTEN that makes them less active. Since PTEN reverses the effect of PI3K, this mutation has the same effect of allowing cell growth independent of insulin stimulation. It is not necessary to know the actual biochemistry in the PI3K-PTEN step but it has some general import in biochemistry and I will try to explain it. 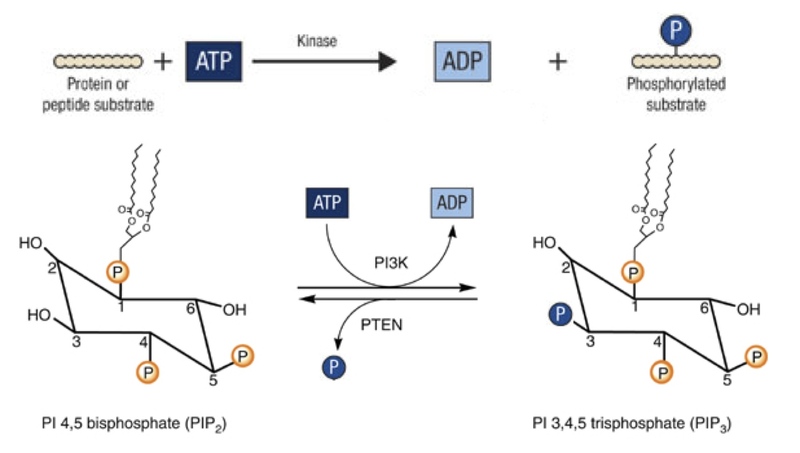 Many (hundreds) of the reactions that go on living cells involve transfer of phosphate groups from ATP to substrates (phosphorylation) and the reverse (de-phosphorylation; hydrolysis). Some proteins or enzymes become more active when phosphorylated and some become less active. It is not an exaggeration to say that the functional metabolic state of the cell is represented in the matrix of phosphorylated and un-phosphorylated proteins and small molecules. The basic chemical reaction is shown below along with the specific reactions catalyzed by PI3K and PTEN. Enzymes that catalyze phosphorylation are called kinases; those that undo phosphorylation and remove (hydrolyze) the phosphate group are called phosphatases. Another statement about the functional metabolic state of the cell is that it is reflected in the relative activities of kinases and phosphatases. The vast set of genes that regulates kinases is sometimes referred to as the kinome. The activities of the kinases and phosphatases are frequently regulated themselves by whether they have been phosphorylated by other enzymes, or even by the enzyme itself, that is, whether they are capable of autophosphorylation. PI3K is a kinase and its target is the phospholipid PIP2 (phosphatidyl inositol bisphosphate) and PI3K catalyzes conversion to PIP3. PTEN is the corresponding phosphatase hydrolyzing PIP3 back to PIP2. The insulin receptor is also a kinase whose targets are the IRS elements (insulin response substrates); the insulin receptor is also capable of autophosphorylation. The Bottom line: insight into cell response. Looking now at the simplified diagram, the presence of insulin stimulates cell growth and proliferation. Lowering insulin represses it, thereby controlling the oncogenic state. DR-resistant cells, however, continue to proliferate even in the absence of insulin. Analysis of the cell cultures showed that some of the cells that are resistant to calorie reduction have the distinguishing feature that PI3K is active all the time. These cells are not waiting for stimulation by insulin; PIP3 is generated constantly, transmitting the information forward. Some of the other cells that were resistant to diet showed a loss of PTEN. Kalaany and Sabatini thus showed how the differing response to nutrients was controlled by insulin-regulated pathways. But we know what stimulates insulin and the question raised is whether testing this system against separate macronutrients will allow tie-in with the extensive phenotypical responses in nutritional experiments. This is how we could bring together the results on cell biology and the effects of low carbohydrate diets and I take this to be the moment of the Second Low Carbohydrate Revolution. Insulin does a lot of things in cells in addition to the cascade that leads to GLUT4 incorporation into the cell membrane. In general, glucagon does the opposite of insulin. Biochemistry textbooks all say that more important than insulin levels are the insulin:glucagon levels. And some studies have shown that if you eliminate glucagon in animals unable to produce insulin, their blood glucose levels are close to normal. This concept is often ignored by popular diet writers who claim that protein is as bad as carbohydrate because it stimulates insulin. Yes it does, but it also stimulates glucagon. Do you know which of the myriad effects of insulin are sensitive to the I:G ratio and which (if any) are not? I do not know without going back to the literature but I am not sure that the question has been addressed in that way. Thanks for another clear exposition… infested with dead royalty or not. Holy cow, but this is an exciting time! A profound thank you from someone so scientifically-challenged that, at first glance, she saw the cell-signaling illustration as a beautifully embroidery. I see what you mean! Thanks! I find the somewhat reductionist fascination with insulin in some ways disconcerting. Of course, it plays a “relatively” important role in the regulation of blood sugar, but its importance has been exaggerated in part due to the diabetes/insulin industry. Insulin itself has been found to account for only about 8% of the “insulin-like activity” of the blood, with potassium being probably the largest factor. There probably isn’t any process in the body that doesn’t potentially affect blood sugar. Reductionist is not, in my view, a criticism. That’s what biochemistry is and the point is not that insulin is the only factor but that it is still the major control point. Following my analogy with a mathematical power series, it is the first order term. It is great to see some real graphical explanations of the signalling process as trying to follow the written word is rather consuming. I did notice that in the first bar graph the (PC3 brain) DR was showing a reduction, yet you are saying it was not reduced, what is correct? PC3 grew to a lower volume on ad lib than some of the others but this was not further reduced by diet restriction. Have you been keeping up with developments in the Human Microbiome project and associated studies as they might relate to metabolic issues? It seems like there may be another whole area (or ‘can of worms’ depending on point of view) that relates to obesity, diabetes, etc. I haven’t seen anyone in the nutrition blogosphere taking up this subject yet, understandably because it is not only a new area of study but potentially huge and complex. Neovascularization of coronary tunica intima (DIT) is the cause of coronary atherosclerosis. There is no mention of insulin or insulin signalling in this paper. But to me it sounds like the same process that occurs in various forms of macular degeneration , which I have seen related to insulin . Also “Angiogenesis involves neovascularization or the formation of new capillaries from existing blood vessels and is associated with the processes of tissue inflammation, wound healing, and tumorigenesis” involves insulin. Do you think atherosclerosis involves these same signalling pathways as you have outlined here in cancer ? What do you think of this particular hypothesis ? Thanks for posting this. is is a global idea and will need a little time to look over it but will post some kind of answer eventually. Would it be fair to say that a CR-KD would have no effect on a PI3K defective malignancy? Also if the malignancy was insulin sensitive (controllable by insulin reduction) could this malignancy “learn” this new trick- or is PI3K a very specialised mutation. Do you have any updates regarding PI3K metabolic therapies? I don’t think that we are far enough along to address that question but I will see if I can come up with relevant information. Malignancy is not due to a single effect. Please understand that the question was not intended to be skeptical. However if a cancer was heavily influenced by insulin insensitivity, such as 30% of breast cancers for example, (assuming that if 30% of breast cancers can be influenced by being overweight- thus possibly insulin resistance is occurring) I am assuming that somehow a KD-R would help- yet could it possibly drive future GLUT1 activation independently of insulin? Looking forward to your reply. You are truly a leader in this new field! Flattery will get you everywhere but the best I can say is yes, “possibly.” We do think that the general health benefits of KD and its involvement with known signaling pathways make it a desirable possible to test, we just don’t know. I know that is not a satisfying answer.